Originally written for the SVA DSI News and Events page. Read the full post here. When our program chair Cheryl Heller was asked to deliver a TEDx talk about creativity in Richmond, she saw a great teaching opportunity—for MFA Design for Social Innovation at SVA, and her undergraduate design class, but also for the greater Richmond community. As Cheryl’s Teaching Assistant, I was excited for the chance to practice the collaborative design process we were teaching (if not also curious as to how the heck we were going to pull off a co-creation project and TEDx talk in the course of a month). Co-creation is about creating “with” not “for.” In order to create real, lasting change, we designers must genuinely engage with the community. As MFA students at DSI, we’re learning this firsthand through place-based design projects, ethnographic research for client work, and our program’s collective ethos of collaboration. But to demonstrate the power of co-creation to Richmond, we realized that it was going to be necessary to design the garden in person together with neighborhood leaders. 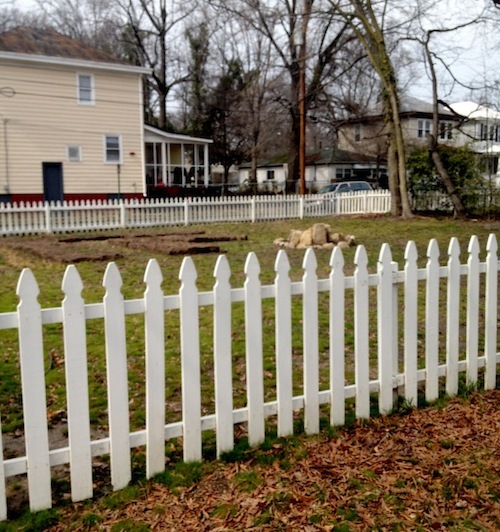 The community of Highland Park, a low-income food desert in north Richmond, said they would love a local garden for fresh, affordable local produce. So we partnered with award-winning Richmond nonprofit Boaz & Ruth to hold a co-creation workshop in Highland Park. Boaz & Ruth is managed by an inspiring group of social innovators and community leaders, providing job training and transitional employment. Our plan was to design and plan a garden for the community that would provide fresh vegetables to both neighbors and Firehouse 15, a family-style restaurant that employs graduates of Boaz & Ruth’s reentry program. We convened a group of organizers, gardeners, maintenance staff, and even Peanut, a delightful little six-month-old who reminded us of the garden’s potential for intergenerational impact. 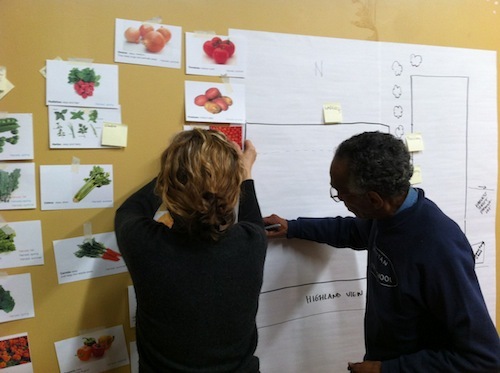 Through fun, interactive exercises, we mapped our collective assets, created a colorful map of where the vegetables would be planted, and defined a timeline and strategic plan. Our undergraduate students, Marisa and Anthony, presented their brand identity work to show the Highland Park team what a logo for their garden might look like. The workshop concluded with commitments from the team to stay engaged and lead a part of the effort. There’s a lot of work ahead to make the garden a reality for Highland Park, but this is just at the starting point. The workshop was an energizing experience for all of us, bridging our differences to create something beautiful. As Cheryl explained that we must count what we have in common and design with our hearts, I could almost see little Peanut nodding in approval, nibbling on a carrot he pulled from the garden. Tags: Cheryl Heller, co-creation, design, Design for Good, garden, Highland Park, Richmond, TED. Bookmark the permalink.